Scleral lenses are indicated for all levels of keratoconus, and are often times the only option for the most severe stages of keratoconus. Their large diameter, on average 16mm in diameter, makes them very stable on the eye. The design of the lens places all of the lens bearing on the much less sensitive conjunctiva and underlying sclera, the "white" of the eye, and vaults over the entire corneal surface. This makes these lenses more comfortable than the aforementioned lenses and reduce corneal micro trauma as no direct contact with the cornea that could lead to scarring. 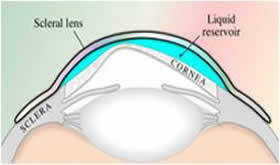 The vision achieved in a scleral lens is similar to a Gas Permeable (GP) lens.